As a terminally diagnosed packrat and garbage hound, this vision of zen productivity is unnerving. I felt better when I peeked at the view under the desk. 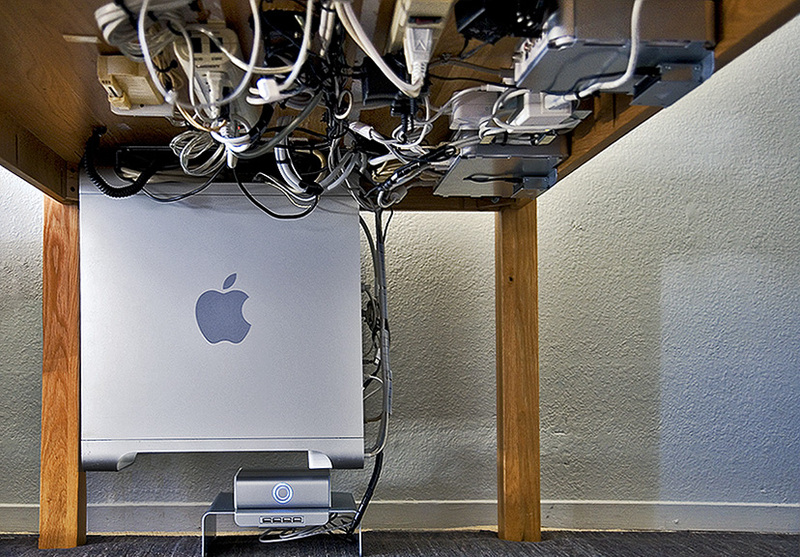 Now that you’ve been blown away by the first image, check out this one featuring all of the cords, drives, and peripherals attached beautifully to the underside of the desk. Wow! I share my home office with my husband and we have often spoken about the space we might save if we had a single desk for both of us. Finding this image showed me that a shared, single desk could be a technical and uncluttered possibility. Thank you, Blupic, for showing us all an uncluttered, space-saving, office setup choice. It’s impressive.